Quite frankly, here at SherWeb, we’re pretty happy every time we get awarded with a prize or distinction. And we’ve had an abundance of occasions over the past years to celebrate the success of our team. The 2013 Microsoft Worldwide Hosting Partner of the Year award we received last year comes to mind, or the multiple times we’ve made it onto the Deloitte Fast 500 ranking. As much as we love recognition that highlights company-wide efforts, we’re pretty stoked when one of our peers gets recognized on a personal level for his or her achievements. That is why we’re ecstatic to report that Samuel Nadeau, who leads SherWeb’s IT Infrastructure team, has been named the recipient of the 2014 MERITIC Award in the Infrastructure Specialist category. 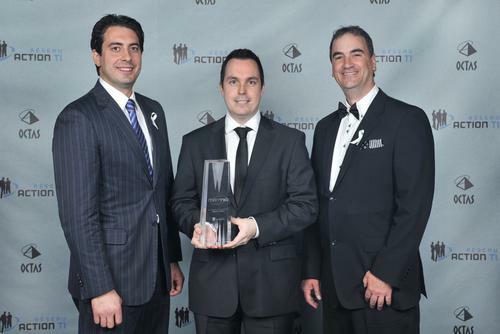 These awards, handed out by the Réseau Action TI every year, highlight individuals within Quebec’s IT industry who stand out, through their professionalism, their knowledge, and most importantly, their achievements. Samuel was presented with the award at the OCTAS ceremony which took place at the Quebec City Convention Center on May 24th. Receiving an award always comes as a surprise. Yet, it is no wonder Samuel Nadeau was considered for the award. For those of us who get the chance to work with him on a daily basis, we have been able to appreciate his deep understanding of IT technologies, especially storage and virtualization. Samuel was at the helm of some hefty projects for SherWeb, including the deployment of 13 Compellent SANs, totalling 2,000 Tb of disk storage. He also oversaw the opening of a new datacenter designed to host hundreds of thousands mailboxes. This is just the tip of the iceberg when it comes to the projects Samuel worked on since joining SherWeb in 2011. And that’s in addition to the daily tasks he oversees. Part of Sam’s day-to-day work is managing a team of ten infrastructure specialists. And boy, does he manage! Here at SherWeb, we conduct annual evaluations of our managers by their employees. Samuel’s team members ranked him amongst SherWeb’s managers with the highest approval rating. This is no small feat particularly when you have that many responsibilities. Another reason for Sam’s recognition has to do with his role in the industry as a whole. He currently holds a seat on the Compellent Customer Council, a group of elite professionals selected by Dell for their visionary qualities. Samuel also played a role in SherWeb’s adherence in Microsoft’s Technology Adoption Program (TAP). Although this is an award given to an individual, it reminds us that SherWeb’s strength lies in its employees’ expertise. We are fortunate to have dozens of technical experts who work day in and day out on our infrastructure, our products and our services. We invite you to take a look at the awards we’ve received over the years, both as a team or as individuals. They act as proof that you can trust SherWeb as your IT cloud services provider. Once again, we’d like to congratulate Samuel on this prestigious award, and here’s to many more!